In this tutorial, you will learn how to create a sliced effect in Photoshop by mimicking a 3D shape on a 2D image to give an object the illusion of being cut in pieces. Open the Faraglioni rocks image in Photoshop. We want to remove the background before using the rocks in the poster. To do this, in the Layers panel, Duplicate the Background layer by pressing Command-J, and Hide the visibility of the original Background layer. While selecting the new Layer 1 on the Layers panel, click on the Vector Mask button to add a Layer Mask to the Background copy. We will use the rock on the right side as it is solid compared to the one on the left. Let’s crop the image using the Crop Tool (C). I am maintaining the height and only closing in horizontally, as shown in the image below. Hit Enter to apply the crop. Select the Magic Wand Tool (W) and head over to the Options bar to make sure the Contiguous option is unchecked. For this specific tutorial we need to delete the sky, so click on a white part of the sky, which will select parts of the sky. In order to add to the selection, hold down Shift and click on the blue parts of the sky. Once all of the sky is selected, head over to the Layers panel. Select the Layer Mask we created for the new layer and hit Backspace on the keyboard to delete the parts we selected. You should have something like the image below. To deselect the parts we selected with the Magic Wand Tool (W), press Command-D.
Now we need to remove the water. 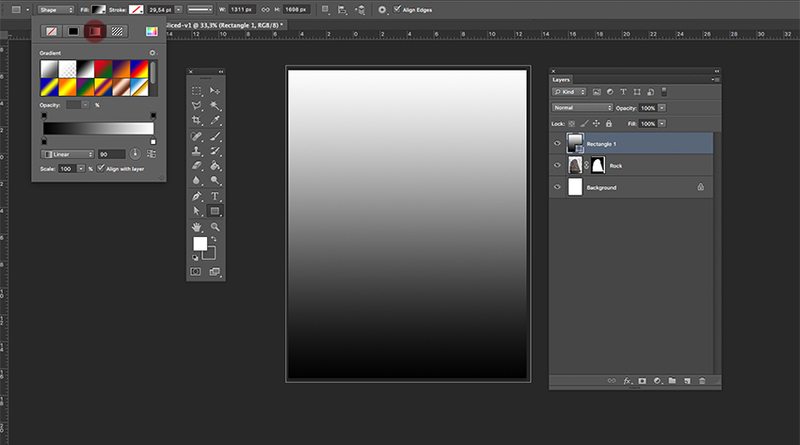 Using the Brush Tool (B) and black as the Foreground Colour on the Tools panel, you can hide parts of the image. If you use white as the foreground colour, you will instead reveal parts of the image. 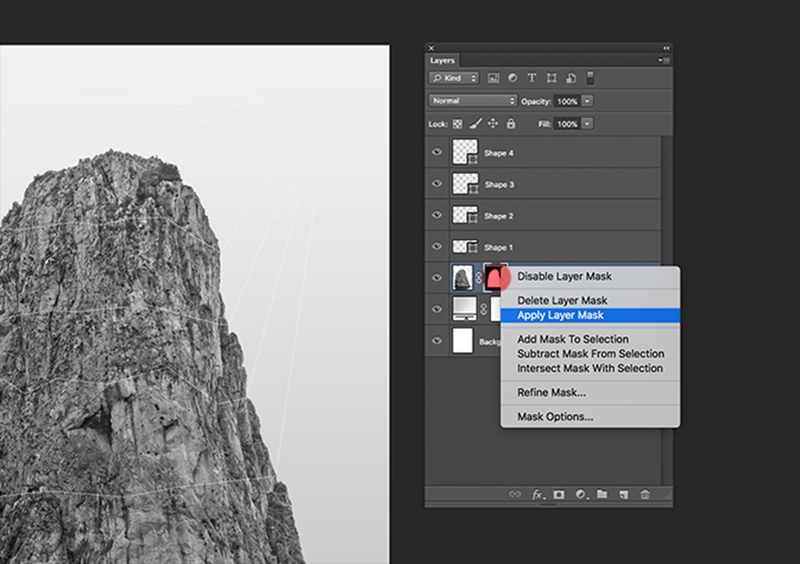 Make sure you have the Layer Mask selected on the Layers panel. Right click to set the brush to a Size of 150 px and Hardness of 100% and start brushing parts away from the image. I like to do the big parts first, before zooming in and concentrating on the details later. A great tool that helps here is using the backslash key () to get a red tint behind the image and see what parts need to be perfected. To soften the edges of the image, we can use the Refine Mask option. Using the Zoom Tool (Z), zoom in on the image. 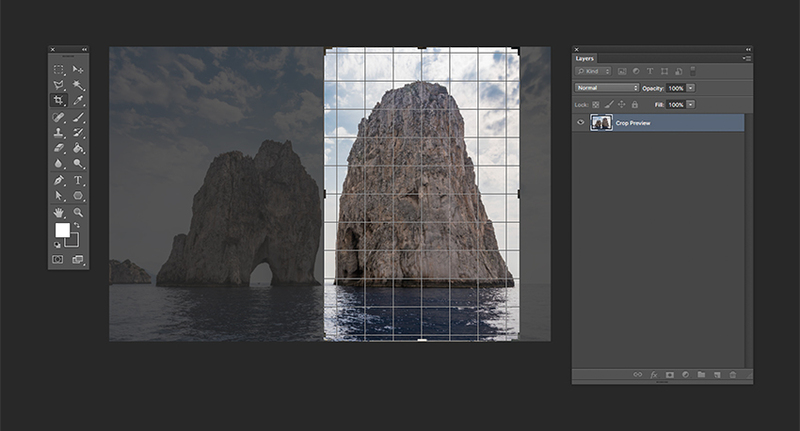 Head over to the Layers panel and right click on the Layer Mask > Refine Mask, and a new window will pop up. Under the Adjust Edge option, set the Feather to 2 px and Shift Edge to -30%. Click OK. In Photoshop, go to File > New. Name the document Sliced-v1, and set the Width to 1275 px and Height to 1650 px, with Background Contents white. I am keeping the poster digital, so I will work with 72 dpi. Click OK to create the document. Let’s create guides in our document to make sure things are aligned. My ruler measures in inches; you can change this in Photoshop > Preferences > Units and Rulers. Head over to View > New Guide, where a new window will pop up. We want to make all of our Guides 1 inch from each edge. Select Horizontal and under Position type 1 in. Click OK.
We will do the same for the Vertical option. To add a guide to the bottom and the right side of the page, subtract 1 inch from the overall dimensions of the page. To hide and show the guides, hit Command-;. 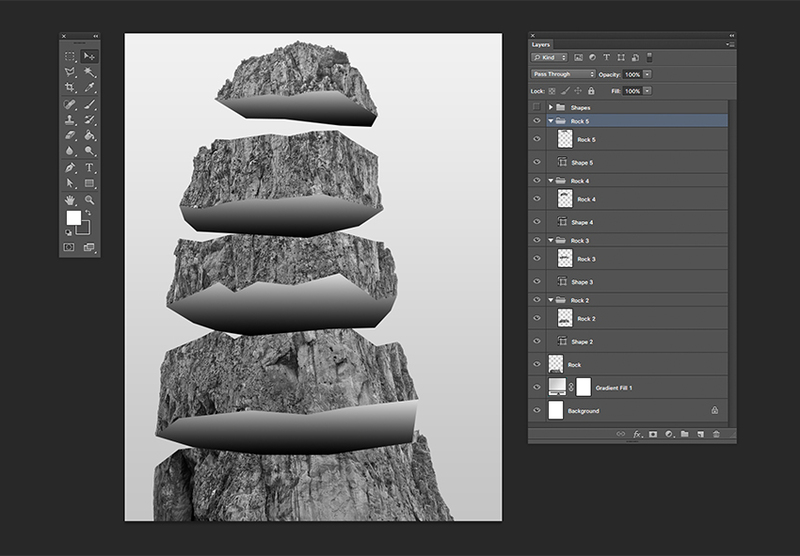 Let’s duplicate the Layer 1 from the rocks file into our new Sliced-v1 file. To do so, Right Click > Duplicate Layers. Under As:, rename the layer to Rock, and under Destination select Document > Sliced-v1. Click OK to continue. 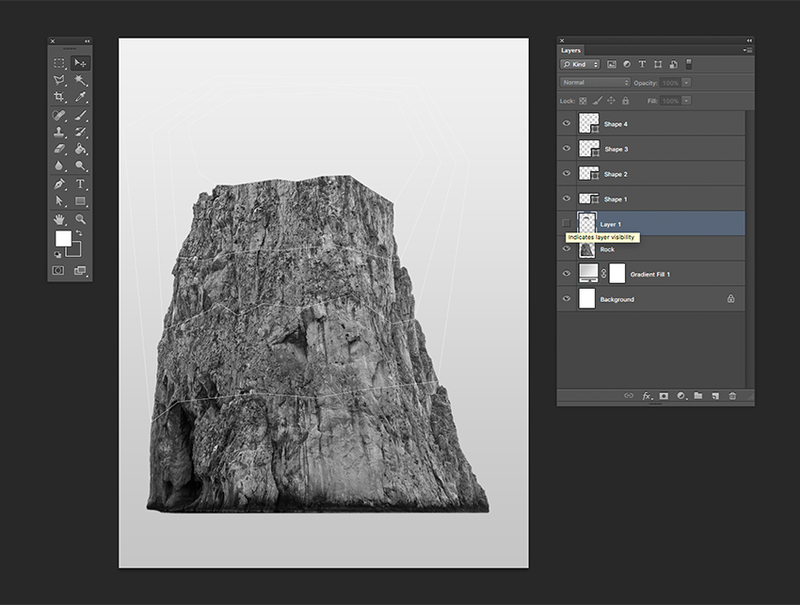 In the Sliced-v1 file, resize the Rock layer by hitting Command-T to activate the Transform Tool. Resize the image to fit within the margin. Alternatively, you can head to the Options bar and set the Width and Height to 58%, making sure to activate the Maintain Aspect Ratio button. Hit Enter to proceed. 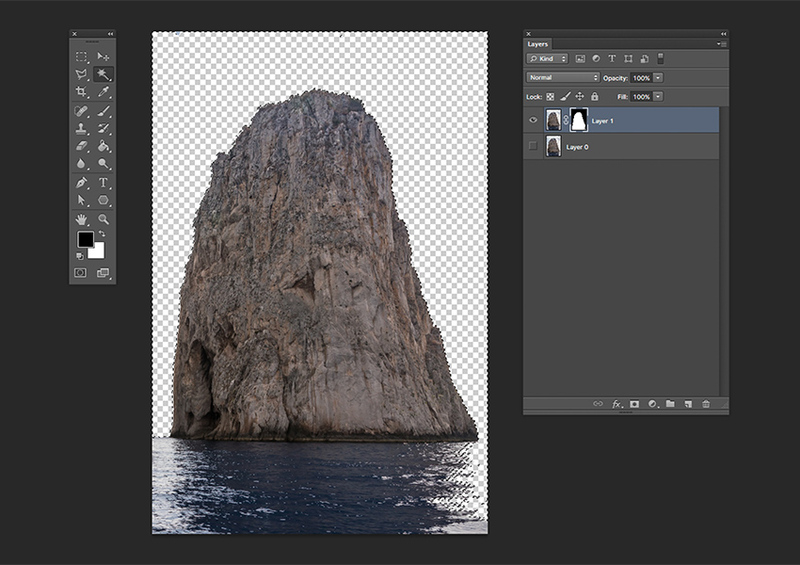 Head over to the bottom of the Layers panel, and click on Create a New Fill or Adjustment Layer > Gradient. 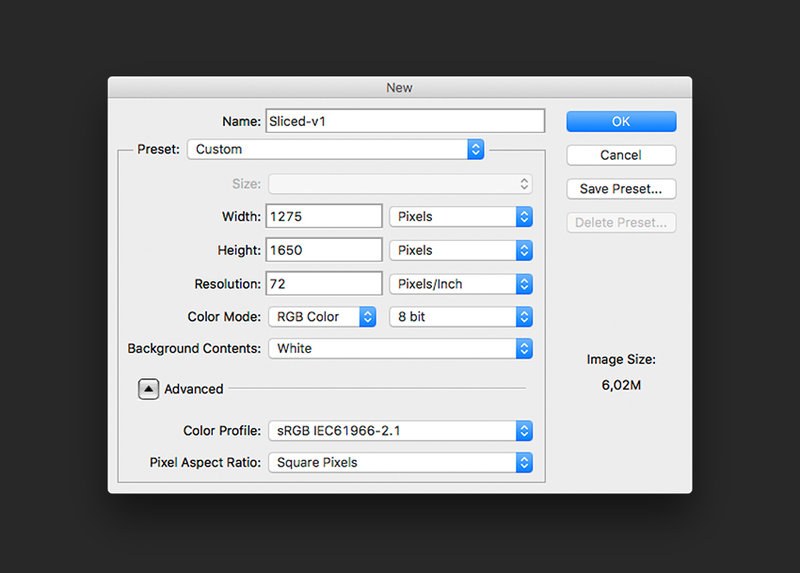 A new Gradient Fill window will pop up; click on the Gradient color space. 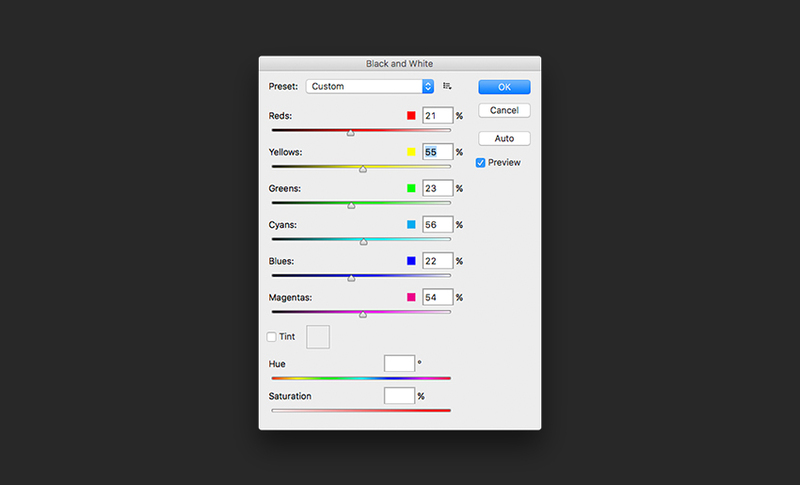 Go to Gradient Editor > Gradient Type, double-click on the left color swatch, and use the following color code: #c5c5c5. Click OK. Double-click on the right color swatch and set the following color code: #f1f1f1. Click OK in all three windows to go back to the page. 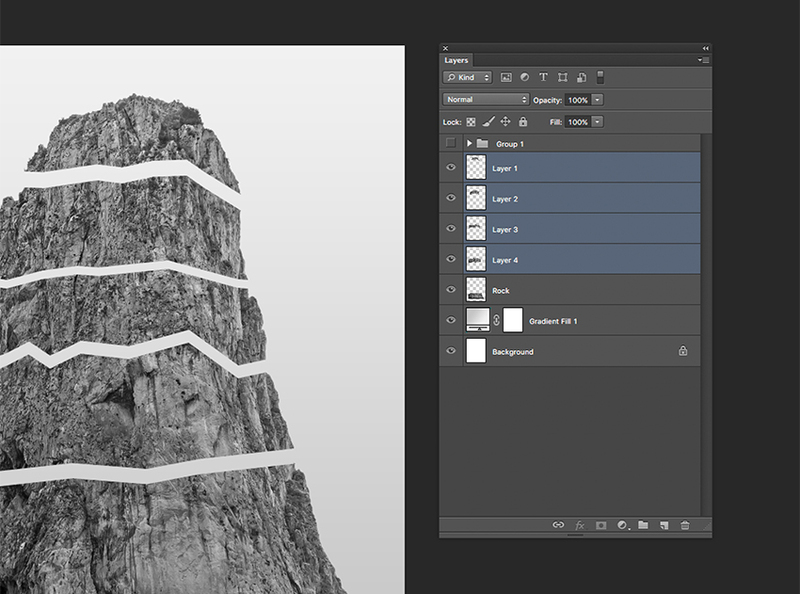 Let’s move the Gradient Fill layer under the Rock layer. 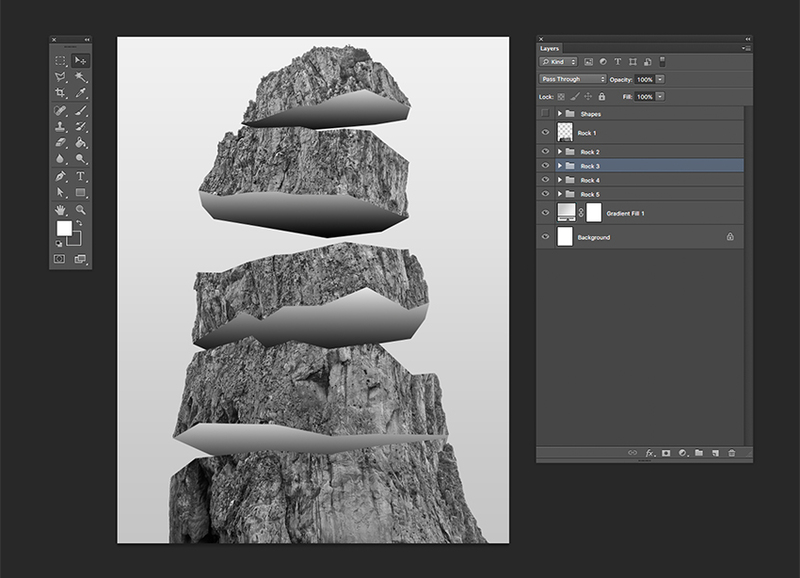 Before we start to create the effect, let’s turn the Rock layer into black and white. 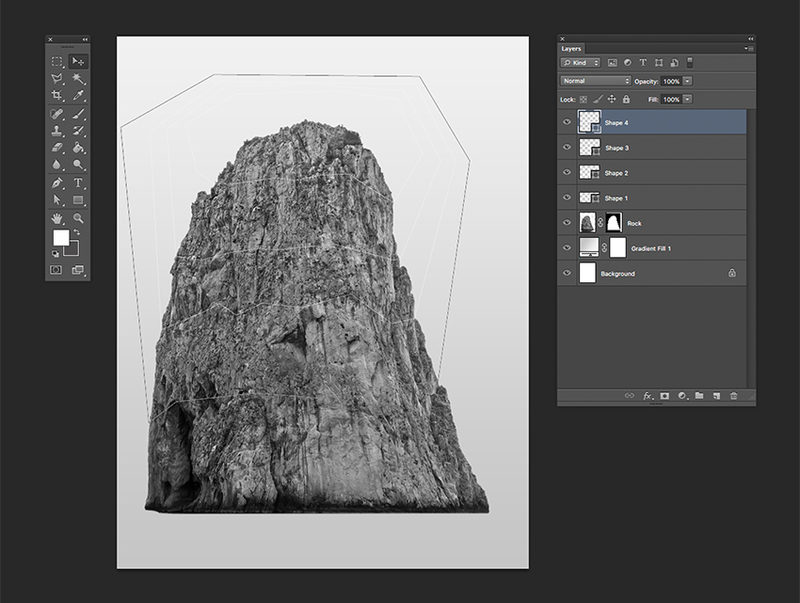 Select the Rock layer on the Layers panel and head over to Image > Adjustments > Black and White. An option window will pop up; click on Auto and then OK. The photo looks dull, so let’s add some contrast. 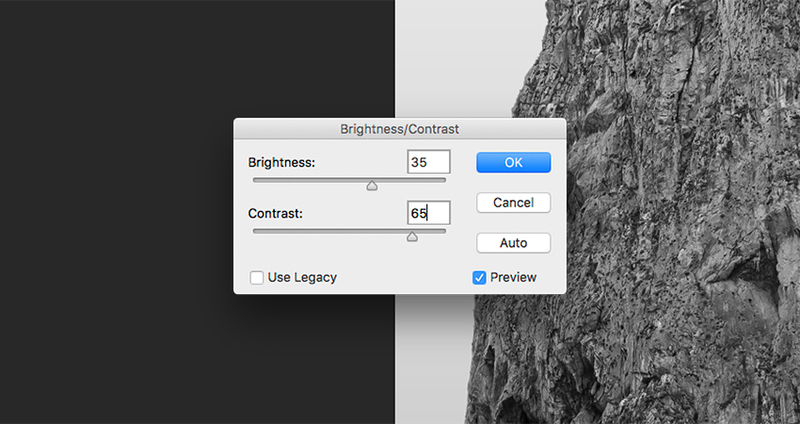 Go to Image > Adjustments > Brightness/Contrast and set the Brightness to 35 and Contrast to 65. Click OK.
We need to cut our image into five pieces. 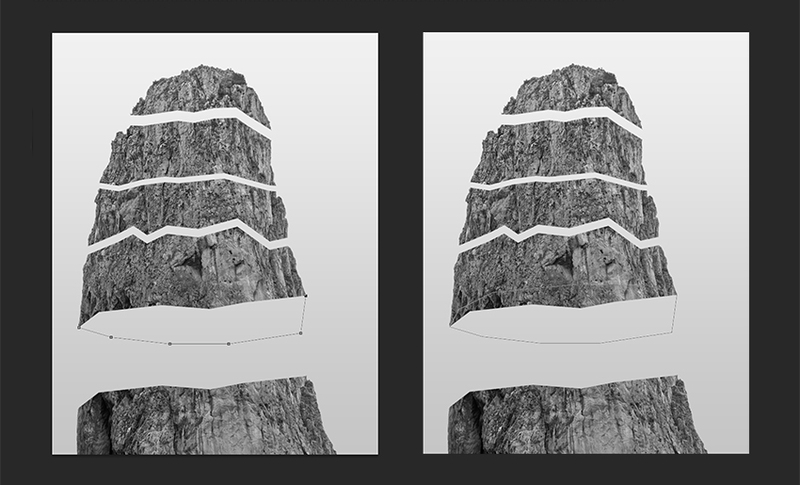 We will be using the Pen Tool (P) to draw through the rock to create a mask. Try to follow the surface of the rock to make the effect credible. Select the Pen Tool (P). Head over to the Options bar and make sure that Fill has no color selected. We can choose white as the Stroke at 1 pt. This is so we can see where we are slicing. Now we are all set! Start by making the first point on the left side of the rock, and try to follow the form of the rock. You will notice I did about eight points, the last point being on the edge of the right side of the rock. Close the shape by going around the rock either around the top or bottom—I chose the top. Close the shape by clicking on the first point again. This new shape will be a new layer. Let’s go ahead and do the same step three more times, but lower on the rock. You can do as many points as you like with the Pen Tool (P). We should have four layers, each containing a shape like the image below. 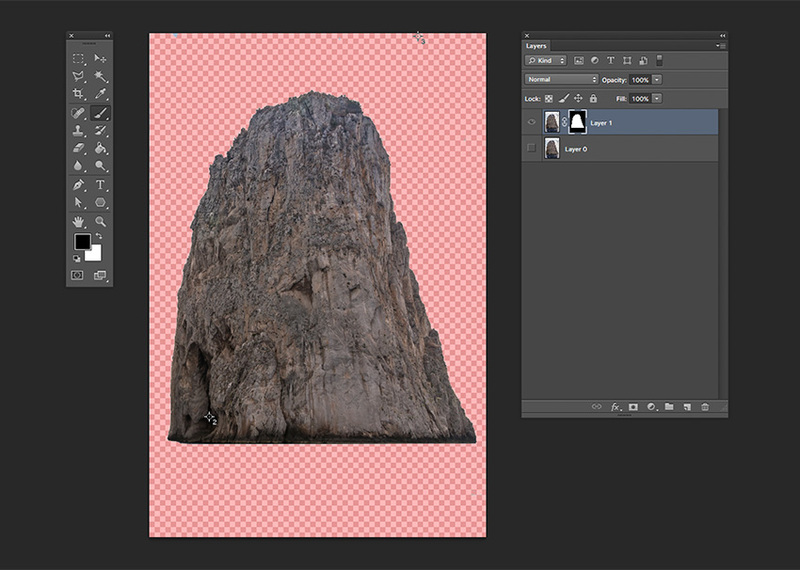 On the Layers panel, right click on the Rock Layer Mask thumbnail and select Apply Layer Mask to delete all of the background we had on the rock layer. We will use the shapes we created as masks to duplicate the different parts of the rock and convert them into separate layers. 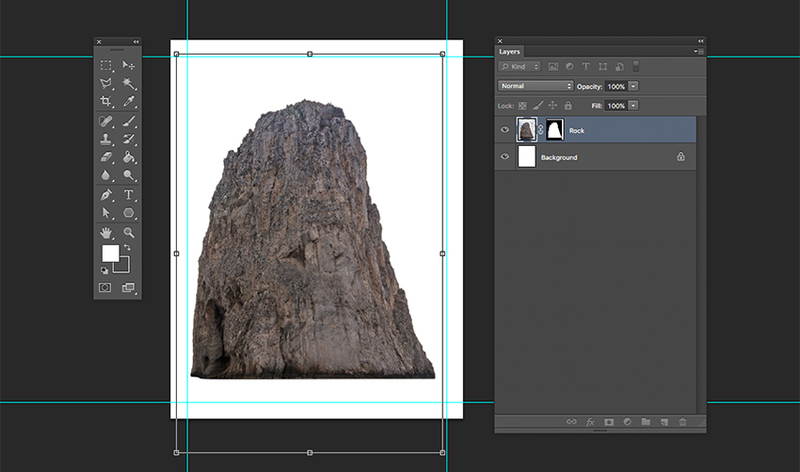 On the Layers panel, press Command and click on the Shape 1 thumbnail, which will select only the shape. Click on the Rock layer and press Command-X to cut, followed by Shift-Command-V to paste in place. This will create a new layer with the first shape we created. Below, I’ve deactivated the layer so you can see which part I’ve cut from the original image. Repeat the same step with the other shapes. Select all the Shape layers and drag them towards the folder icon on the Layers panel to group them. Deactivate them so we don’t get confused. Below I have moved the layers to show you how they should be separated and how the Layers panel should be looking. Now that we have the rock as puzzle pieces, we will create the 3D effect. I am moving the Rock layer off the bottom margin to give space for the other rocks. We will work our way up. Select Layer 4 or the second layer from the bottom. 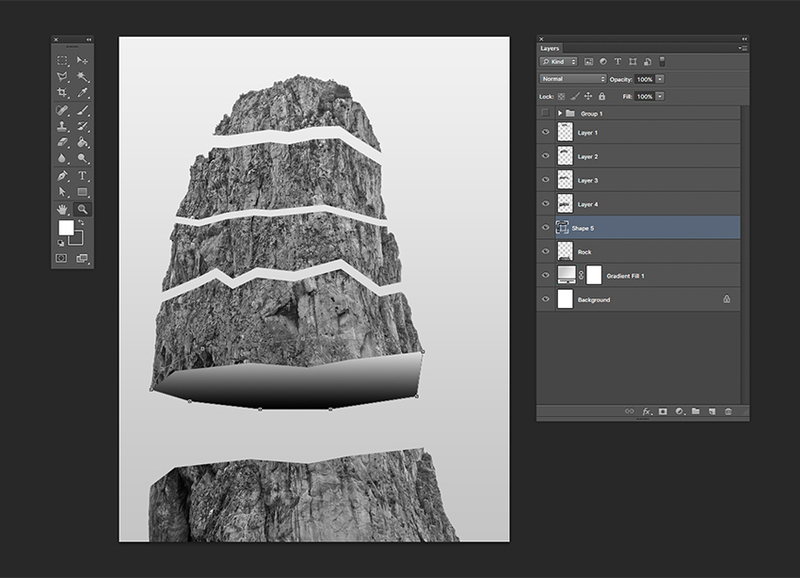 Using the Pen Tool (P), we will draw on the bottom of the rock to form a 3D look. Click on the very edge of the left side, giving shape to the rock all the way to the edge of the right side (image on the left). To close the shape, this time go through the rock (right image). If you want to change the shape, simply select the Direct Selection Tool (A) and click on the shape to bring up the points and edit. There is no right or wrong, so you can edit as much or as little as you want! Drag the shape under Layer 4. Head over to the Options bar and select Fill > Gradient and Stroke > None. We will worry about the color of the gradient later. Group these two layers to avoid confusion. Do the same step as above for the other rocks. I will organize the layers by grouping the shapes layers with their correspondent rock layers to avoid confusion and naming them numerically. You should have something like the image below. We want to create the illusion that the slices are falling on top of each other. In this specific image, our eyesight is at a low angle as we are looking up at the rock. The 3D parts we created need to be behind each other from bottom to top. Let’s switch the order of the layers. Instead of going from 1 to 5, we will have 1 to 5 starting from the top. 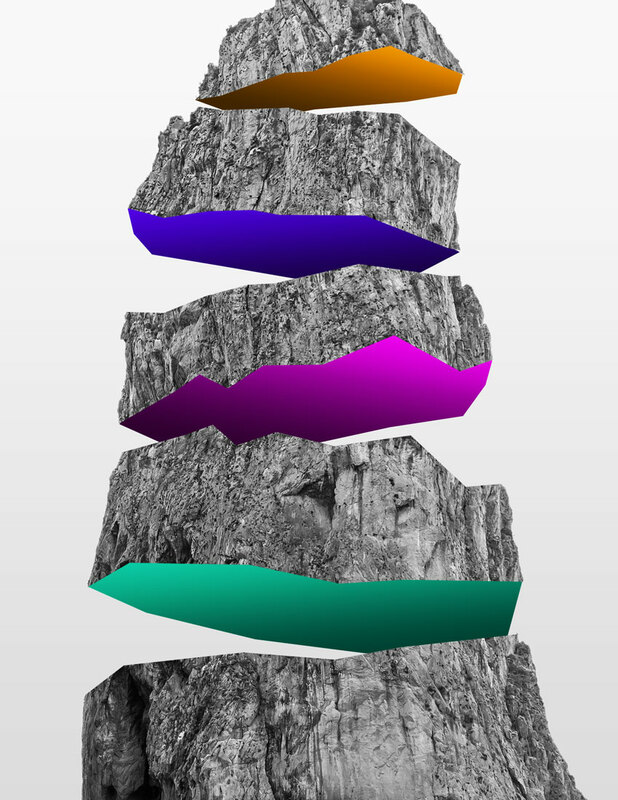 In other words, the gradient shapes we created need to be behind the rock. 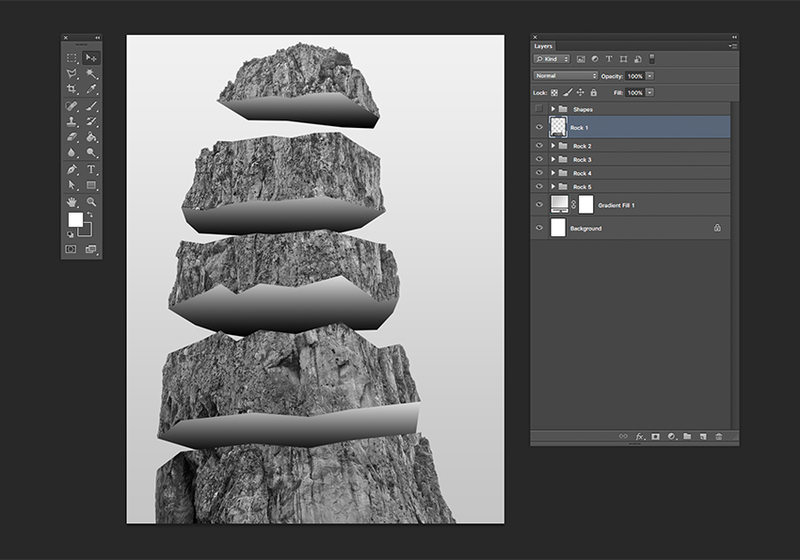 Below is an image of the order of the layers and how the file should be looking. Now that we have the layers in the right order, let’s give them a spontaneous look. Select different sections and use the Transform Tool (Command-T) to rotate them slightly. There is no right or wrong—you can move them as much as you like and resize as you wish! 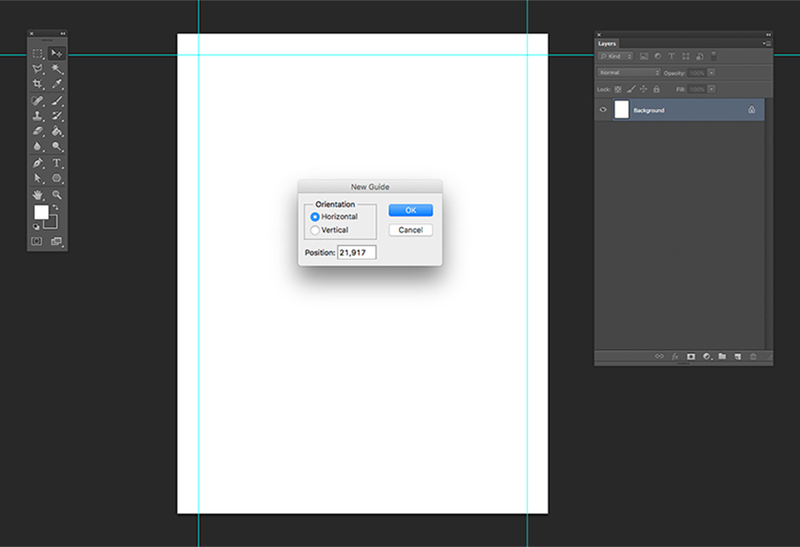 On the Layers panel, expand one of the folders. 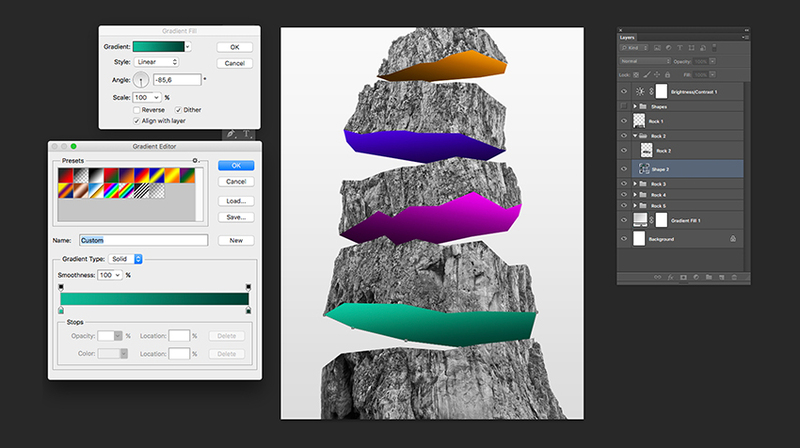 I will be expanding Rock 5, so double-click on the Shape 5 layer to bring up the Gradient Fill window. Here we need to change the Angle of the gradient; mine is at -100. The darker color we will choose later on needs to go on the side closest to the bottom rock, and the brighter side on the side that is farthest from the rock. On this specific layer, the closest point is on the left side, while the farthest is on the right. This will be different on all the layers. Feel free to use this as a reference. Double-click on the Gradient color swatch. In the new Gradient Type window, double click on the left color swatch. I am using an orange color with the following code: #ef8d00. Click OK. Double click on the right color swatch and choose a darker color than the one above; I am using #412701. Click OK on all the windows. The image should be looking like the one below. Create the illusion of a 3D object on a flat image. 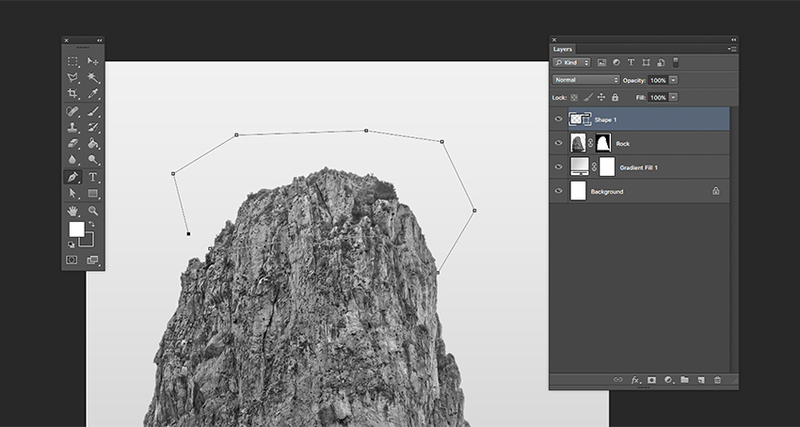 Use the Pen Tool to create shapes that can be used as Masks on an image. Use the Gradient Tool to create the illusion of light and shadow.